It is no secret that Canon and Nikon are archrivals. For decades, they have dueled for the top spot among the hearts and minds of consumers – Canon has been winning this fight and has been rewarded with being the world’s number one camera manufacturer. Part of this rivalry has been dramatically on display in the weeks leading up to and during Photokina, the world’s largest imaging fair. On Sept. 13th, Nikon announced the D600, a 24.3-megapixel full-frame sensor DSLR that targets the most avid camera enthusiasts in the consumer market. The D600 turned heads for its price, costing nearly a $1,000 less than Nikon’s most affordable full-frame professional DSLR. On Monday, Canon took the spotlight from Nikon with the debut of its own lightweight and full-frame DSLR, the 20.2-megapixel EOS 6D – it competes directly for consumers attracted to Nikon’s D600. Interestingly, the 6D and D600 are priced within pennies from each other, both costing around $2,100. Canon’s EOS 6D taps some of the company’s best technology and wraps it into a new DSLR that sits between the 5D Mark III, and the brand’s top enthusiast’s model, the 7D. The 6D’s 20.2-megapixel CMOS sensor puts it on par with the 5D Mark II’s 21.1-megapixel sensor. 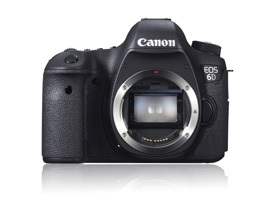 But the 6D adopts the newer DIGIC 5+ image processor found in the 5D Mark III. The combined sensor and image processor assists the 6D in achieving a broad ISO range of 100-25,600 (expandable to 50 and 102,400) and a quick continuous shooting speed of up to 4.5 frames per second. The camera also packs in a few novelties – a built-in GPS unit coupled with wireless technology – that are not included in its 5D Mark III, or rival Nikon’s D600. Even with all these extra goodies, the EOS 6D is dramatically more lightweight and compact than the Mark III. It weighs 775 grams and measures 145 x 111 x 71mm’s compared to the Mark III’s 950 grams and dimensions of 152 x 116 x 76mm. Interestingly, the 6D’s specs make it even lighter and slimmer than the 7D, and more comparable to the physical anatomy of the 60D. • DIGIC 5+ image processor. • 1.04-million -dot resolution and 3-inch LCD screen. • ISO range of 100-25,600 and expandable from 50-102,800. • Built-in GPS and Wi-Fi. • 1920 x 1080 Full HD video at up to 30 fps. Of course, this wouldn’t be an adequate Canon DSLR without the company’s legendary video technology. And the EOS 6D delivers by tapping the video specs similarly found in the 5D Mark III, including the ability to film 1920 x 1080 video at up to 30-frames-per-second. Scale back the size of the HD video to 1280 x 720 and the 6D can film at up to 60 fps! The 6D also offers a space for a stereo mic jack for better sound. These specs make the 6D attractive for not only photo enthusiasts looking for the image quality of a full-frame sensor, but also for professional photographers looking for a second and more affordable camera body. Here are more highlights of Canon’s EOS 6D.